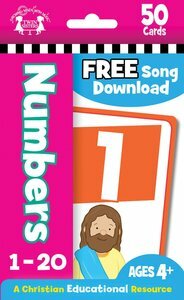 Parents will love these Bible-themed numbers flash cards as much their kids! Fun, colorful designs complement the numbers 1 through 20 on 48 unique cards designed to help build counting and number recognition skills for kids ages 4 and up. After playing with the flash cards, parents and kids can download the free song "Who Built the Ark" to further enhance the love of learning! About "Flash Cards: Numbers (Age 5+) (Pk 50)"